World Cup – Opening Stadium Impasse Still Unresolved . Must be today! 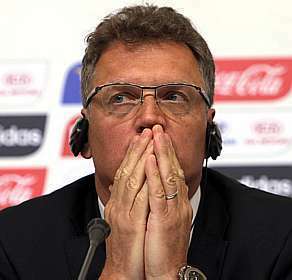 Jerome Valcke, Fifa , is looking more and more distressed by the day. Yesterday, in a Press Conference he tried to hide his desperation and impatience when announced that , contrary to Joseph Blatter recommendations, he was extending the deadline until today,(Friday 28th) for the impasse about temporary structures to be resolved. He mentioned being confident that the problem would be solved as Odebrecht, one of the biggest contractor in Brazil, was involved in Itaquerão, the stadium in São Paulo where the Opening match between Brazil x Croatia will take place on 12th June. Valcke reinforced his fear about the lack of time to test the venues before the kickoff of the World Cup. – There are still things to do. 77 days is a short time. The problem is not to install but to test structures. Everything is very on edge – he added. But why are the temporary structures causing so much controversy now? It is simple. As owners of the tournament, Fifa has a verity strong bargaining power and can, literally, include whatever they want in a contract. Their demands must be fulfilled. And the temporary structures were included in all 12 contracts made with each of the stadium back in 2009. Nine out of the 12 stadia are managed buy local authorities and, therefore, had all the expenses paid by them. Itaquerão (Sao Paulo), Beira Rio (Porto Alegre) and Arena da Baixada (Curitiba) , however, belong to local teams and , understandably, they do not want to spend money on temporary things. Having said that, they did know that 5 years ago, when they signed the contract (one would have hoped) Isn’t that enough time to get their act together? I’m afraid another great opportunity to show the world an inspiring picture of Brasil has been missed.